1. 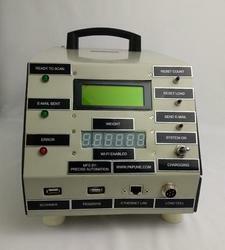 Incinater pameter printer and server data logging device. 2. Online energy monitoring and recording system for Incinerator / Plasma Pyrolyisis/ Autoclaving/Microwaving/ Hydroclaving/ Shredder/ Dry HeatSterilization/ ETP with separate energy meter on each equipment. 3. 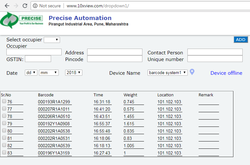 Barcode system Controller : Inbuilt battery, Dual display, Barcode+loadcell connection, inbuild GPS tracking system. 4. Barcode system weight platform : 30Kg or 40Kg. 5. Barcode scanner for barcode sytem. 6. 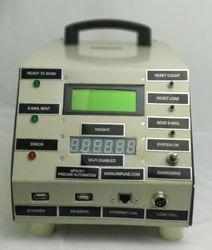 Barcode lable printer for barcode system. System delovoped and programmed as per CPCB BMW Rule-2016. This product is specially design , develop and manufactured for Bio-medial waste treatment facility operator. Device is designed as per CPCB's BMW Rule-2016. We have already installed this device in several BMWTF operator in India. 1Print bar code: Go to server application provided by us select occupier and print required bar code using label bar code printer given by us. 2.Supply Bar code to occupier: Give bar code along with waste collection bags to respective occupier, now it is duty of occupier is to use respective colored bag for respective type of waste and stick bar code lable on it and make ready to be pick by operator. 3.Waste collection: Operator need to keep Bar code system set (Bar code system controller , weighting platform and bar code scanner) in pick up vehicle .When pick up vehicle is on occupier's door , weight and scan each bags. Bar code system will keep record of all collected bags by weight , bar code, occupier name and GPS location. 5.Trasport to facility : After pick up come back to facility re-scan bags to insure waste given by occupier is correctly arrived for disposal.GPS device will keep track of rout vehical goen through , although no internet connection. 6 Data upload and maneg: See server application specification for details.Application will auto generate waste collection report based on Occupier, type of waste , weight , bar code, locaton of waste pick up and location of waste disposal. 1. USB Bar code scanner. 2. 30 Kg Weighting platform. Separate 7 segment display for weight. Data log memory : 1GB. 3. Collection data record for last five years. 4. Recode filter as per date, occupier, machine, bag color. 9. Data back up and restore. 11. Account recivable, account payble. 12. Auto generate Reporting as per format given by CPCB. 13. Auto e-mailling anual report and dailly collection report. 1.After confirmed PO, our representative will visit your facility to explain implimentation of barcode system. 2.Hardware will deliver to your facility and our service engineer provide proper training about machine operation along with operational documentation with videos. 3.Operator will provide all data , like list of occupier with details, pick up vehicle rout. Data will upload to server and login will created. Note : Web application will be free of cost along with hardware . We never charge monthly/year basis for web hosting also not for GPS tracking . Only one time hardware cost is applicable. Packaging Details: corrugated box with foam or wooden box if shipping quantity more than 10 units. This application is made for complience of BMW rule 2016. Hospital woner need not to worry about hospital waste manerment and disposal , this web application will keet track for all and also auto generate report for same, so that hospital woner insure complience and focus on main busienss. 1. Waste generate by hospital vs enngement of bed. 2. Reporting to opertare to pich up waste. 3. Fequecy of operatre picking up watse. This product is specially design , develop and manufactured for for hospiotals more than 30 bed , for complience of BMW rule - 2016. 2. Right barcode for right bag: use respective colored bag for respective type of waste and stick bar code lable on it. Weight and scan each bags , data will automatically log on server application. 6 Data upload and maneg: See server application specification for details.Application will auto generate waste collection report based on Occupier, type of waste , weight , bar code, locaton of waste pick up and location of waste disposal.Data then shared with hospital and cross checked automatically. 2. Collection data record for last five years. 3. Recode filter as per date, occupier, machine, bag color. 4. Data back up and restore. 6. Auto generate Reporting as per format given by CPCB. 3.Login will created to start application. Note : Web application will be free of cost along with hardware . We never charge monthly/year basis for web hosting. Only one time hardware cost is applicable.